Loretta Maria Patterson was born on April 12, 1957 in Wasco, Ca to parents Fred Soto and Carmen Sanchez. Loretta was a loving mother, grandmother, sister, and aunt to everyone. Loretta was a positive person who loved life and could not wait to get her day started with her grandchildren. She had special bonds with each of her children. Her contagious smile and positive personality will be missed dearly. 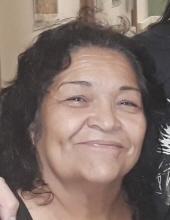 Loretta is survived by her sons, Jason Eli Patterson and wife Renee, Tobias Patterson; daughter, Anita Smith and husband David; sisters, Teresa Cox, Lydia Adams, Olivia Mendoza, Ortencia Regalado, Maria Cazares; brothers, Alfred Soto and Anthony Soto; 14 grandchildren, 3 great grandchildren; many nieces, nephews, and family. She is preceded in death by her brothers, Albert Soto, Felipe Soto; sister, Betty Moore. To send flowers or a remembrance gift to the family of Loretta Maria Patterson, please visit our Tribute Store. "Email Address" would like to share the life celebration of Loretta Maria Patterson. Click on the "link" to go to share a favorite memory or leave a condolence message for the family.